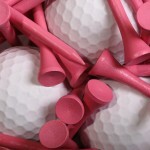 Are you a woman who uses golf as a business strategy? With all the statistics lately showing that the number of women CEO’s and women on boards of directors is not increasing, it seems to me that women need some new strategies and playing golf for business has got to be one of them. I know from my own experiences how valuable golf has been to my business career. I also hear similar stories from my clients. One client of mine recently shared how playing golf in just one outing led to three new clients—one of whom has become her best source of business. Another client shared a story about a conflict she was having in her office with another manager. Her boss (who was also the manager of the person she was struggling with) decided to put the two of them together in the same foursome in the best ball team competition in the company’s yearly golf outing. While initially dreading the pairing, my client said that playing together in the golf outing led to a newfound mutual respect –and enabled them to go out and win a new piece of business together the following month. Are you a woman who uses golf as a business strategy? We would love to hear from you. Please share with us your stories on how you are using golf successfully in your business career. This entry was posted	on Wednesday, December 7th, 2011 at 10:41 am	and filed under Blog and tagged with business golf, White House Project Report, women's golf. You can follow any responses to this entry through the RSS 2.0 feed.